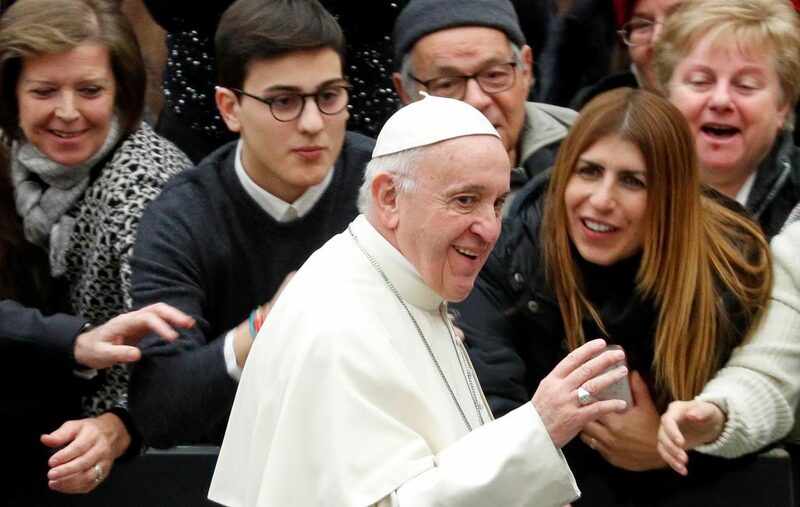 VATICAN CITY (CNS) — Christmas will not be authentic if people get caught up in a frenzy of shopping, presents and meals, all while ignoring the poor and forgetting who the celebration is really all about, Pope Francis said. “If Christmas ends up as just a beautiful traditional holiday,” where everything revolves around “us and not him, it will be a lost opportunity,” the pope said Dec. 19 during his weekly general audience in the Paul VI audience hall. “Please, let us not make Christmas worldly! Let us not put aside the one being celebrated” — which is what happened at Jesus’ birth when so many of “his own people did not accept him,” he said. With less than a week to go before Christmas, Pope Francis dedicated his audience talk to the true meaning of Christmas and the kind of “gifts” and surprises that are pleasing to God on that day. “Trees, ornaments and lights are everywhere” to remind people of the coming holidays, the pope said, and the advertising and promotional “machine invites people to exchange more new gifts to surprise” others. “But is this the holiday that God likes? What kind of Christmas would he want, what gifts and surprises?” the pope asked. The answer to figuring out what God wants, he said, is to look at the first Christmas. The day of Jesus’ birth was a day “full of surprises” in which everybody’s life took totally unexpected turns, and customs and plans were turned upside down, he said: Mary, a virgin, was going to have a child; Joseph, her groom, faced scandal with her pregnancy, but listened to God and took her as his wife; and the divine Word came as an infant incapable of speech. Christmas, therefore, “is welcoming on earth surprises from heaven,” the pope said. Christmas “turns the tables” because the victors are humility over arrogance, simplicity over abundance, silence over noise, prayer over “me time” and God over one’s ego, he said. People should likewise choose God’s silent voice over the “uproar of consumerism,” he said, inviting people to take time out to sit in silence before a Nativity scene and let themselves feel awe and be surprised by God. God asks people to be on guard against spreading themselves too thin, being overburdened with busyness and blaming it all on the world when he warns people to not let themselves be dragged asunder by the world. “It will be Christmas if, like Joseph, we make room for silence; if, like Mary, we tell God, ‘Here I am’; if, like Jesus, we are close to those who are alone; if, like the shepherds, we leave our sheepfolds in order to be with Jesus,” Pope Francis said.